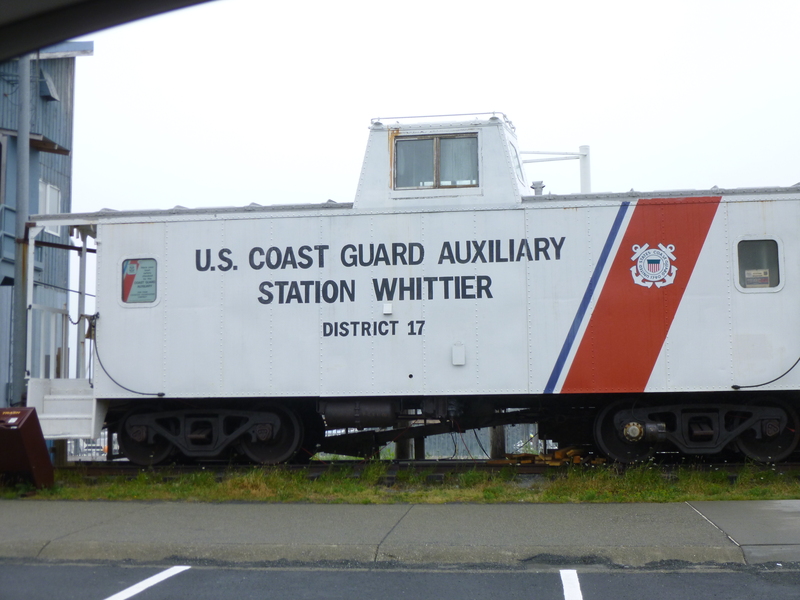 The first thing on the agenda this morning was a visit to Whittier, which is a town that wasn’t really open to tourists until about 2000, because the only access into town, other than coming in by sea in the Prince William Sound, was the railroad, which had to go through a 2 1/2 mile tunnel under all the massive mountains. There were no roads into town. 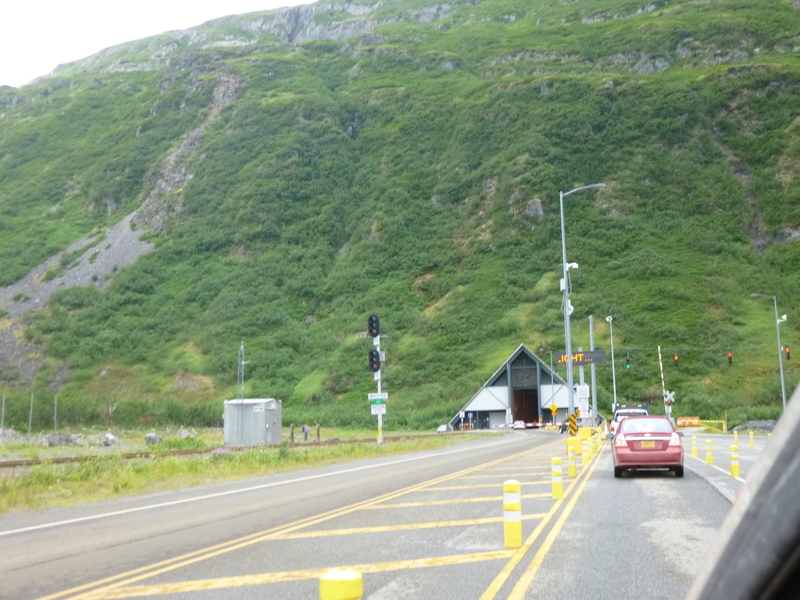 But around 2000, they decided to make the railroad tunnel a combined auto/train tunnel, so that tourists and residents could drive in (Whittier is also one of the stops on Alaska’s Marine Highway). The tunnel is only one lane, and obviously the train schedule has top priority. Cars have to pay a fare and be assigned a lane in the staging area, and groups of west-bound and east-bound vehicles alternate. 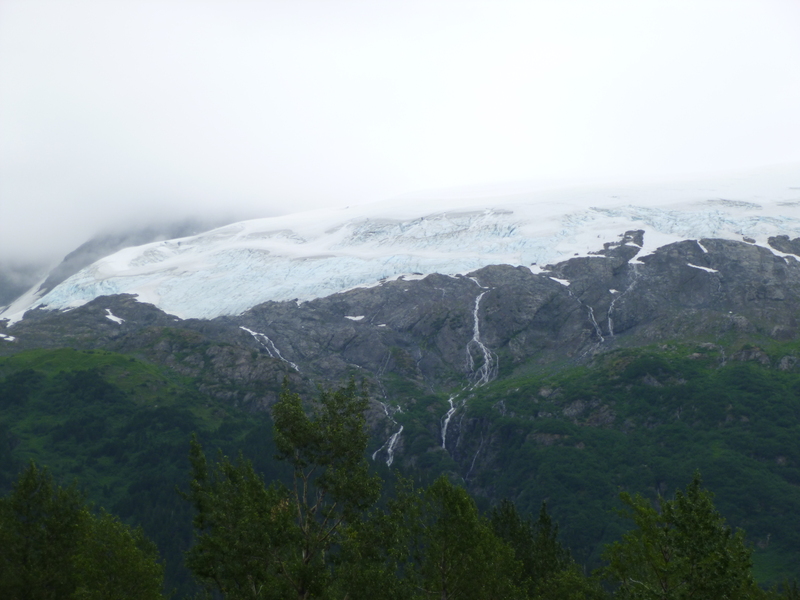 I wanted to see all of this, and it wasn’t too far from my Alaska exit route. 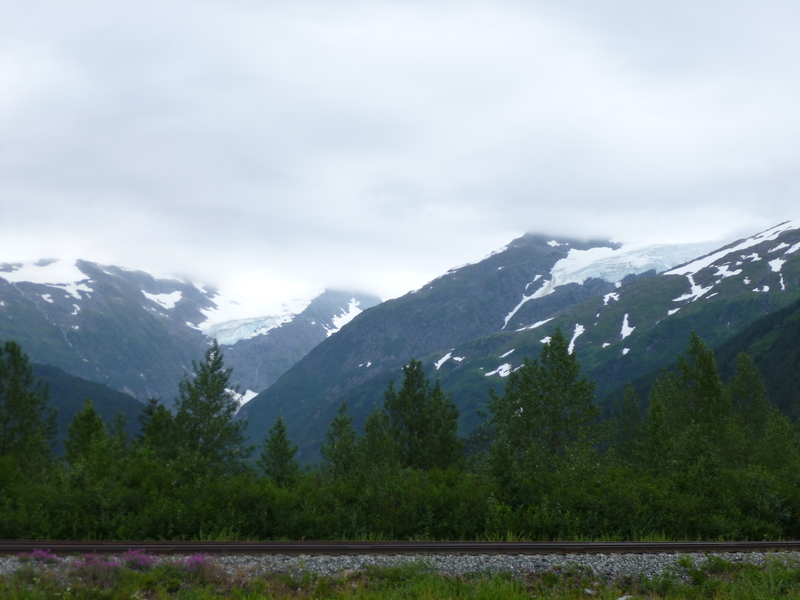 So I had only driven about 10 miles toward Whittier, and was near the tunnel staging area, when I came around a bend in the road, and then was almost completely surrounded by mountains and glaciers. 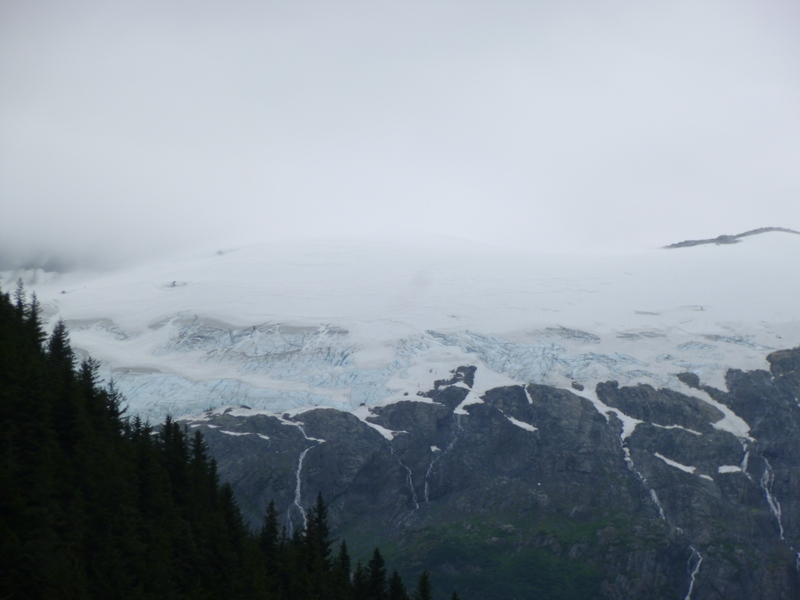 It’s a good thing there was a big pull-off, because it was a dramatic, scenic view – blue/white glaciers in every direction. It was a little misty, which just kind of added to the charm. 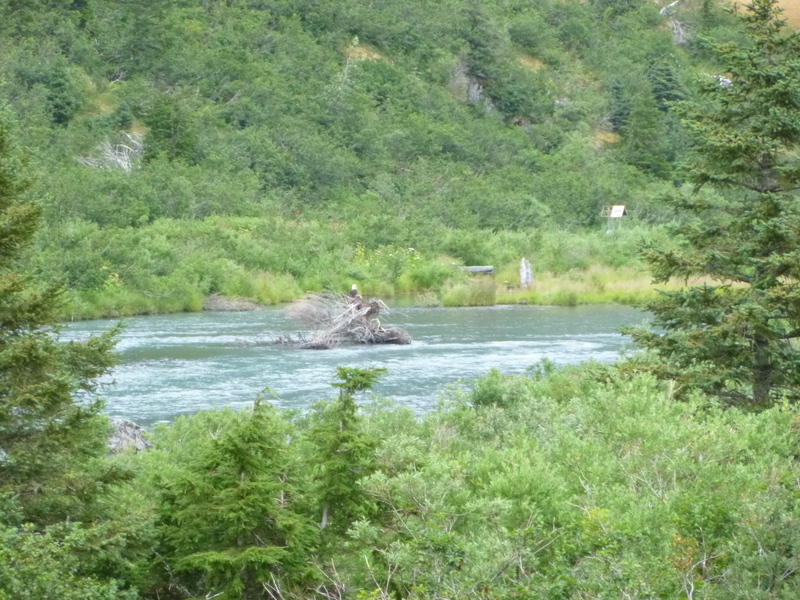 And someone pointed out an eagle on a log in the river. After I had spent some time gazing around, I got my tunnel ticket, and got in line. They have big road signs up, letting drivers know when the next group of cars will be “released.” The tunnel entrance looked like a little A-frame house, and was long and a little damp. 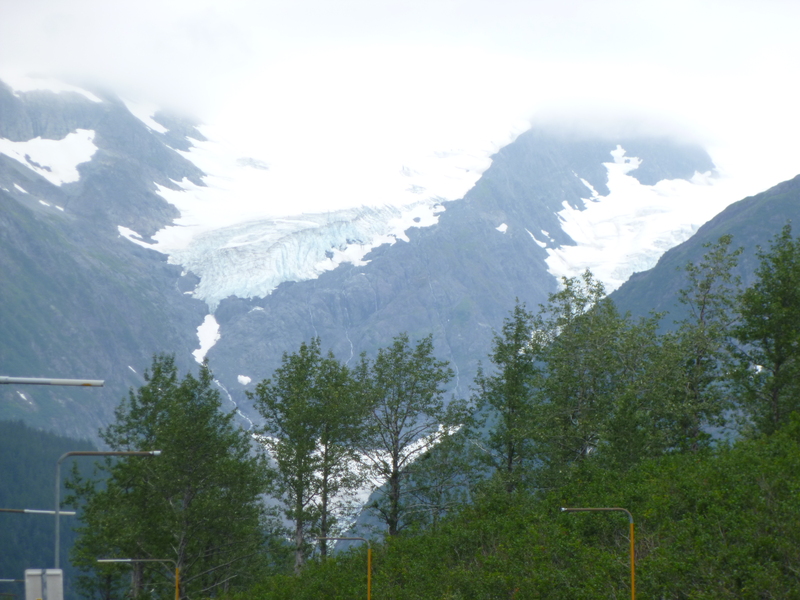 I don’t like to think about the tons of rock, snow and glaciers that I’m driving under. It was fairly well lit, and signs pointed out the locations of 5 or 6 ventilated safety chambers that could be used in case of emergencies or fires. It’s just a single lane road, with the train tracks running down the center, and it’s narrow – the tunnel isn’t much taller or wider than the trains that first used it. After 2 1/2 miles, I came out the other side to a small, older sea-going town that was covered in fog. I could hardly even see the water. It’s not a big town, but it is a bit of a transportation hub, with ships bringing in freight for trains, and the passenger traffic for the ferry system. 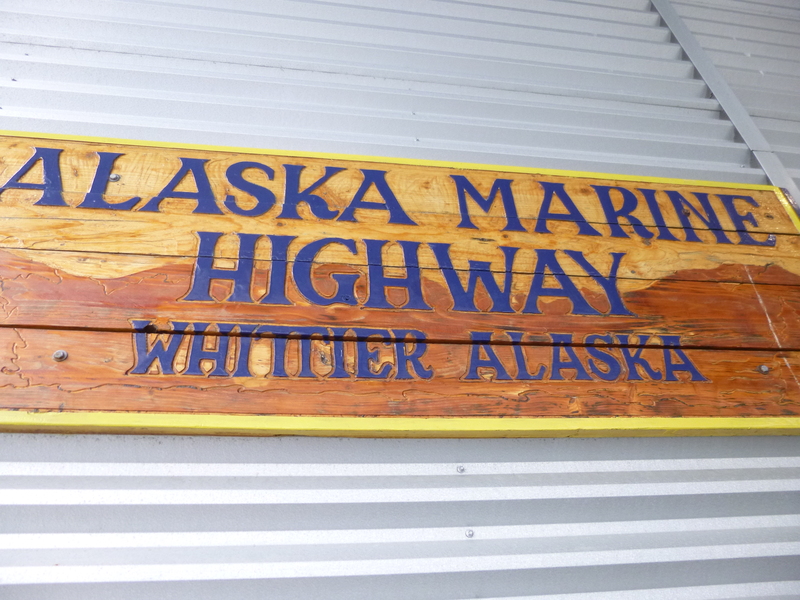 I hadn’t known much about the Alaskan Marine Highway, which is probably a good thing – I didn’t need to be cramming anything else into this particular visit. But it has sure given me some ideas for the future (the Aleutian Islands are calling!!) 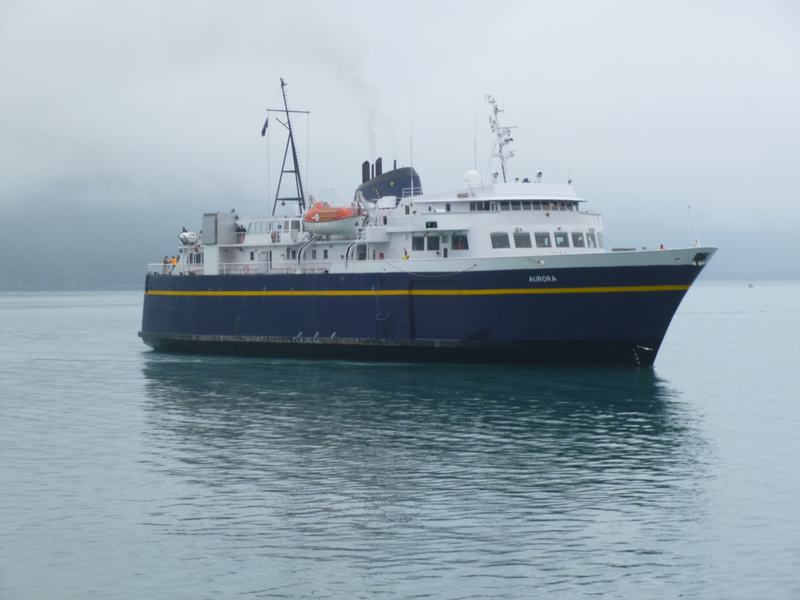 I picked up some literature, and asked about a ferry to Skagway on the off chance I could do that instead of driving back up to the Alaska Highway and down into Canada – Skagway is accessible by road, but one has to get into Canada first. 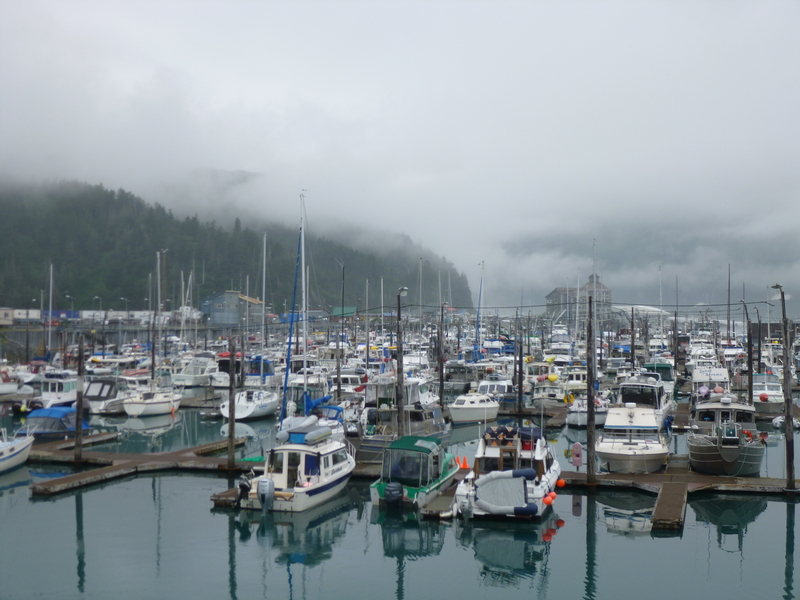 A lot of towns on the Alaskan panhandles have no road access – one can’t even drive into Juneau, the state capital! I went into the ferry offices and got some schedule info – it was a little hard to figure out at first. 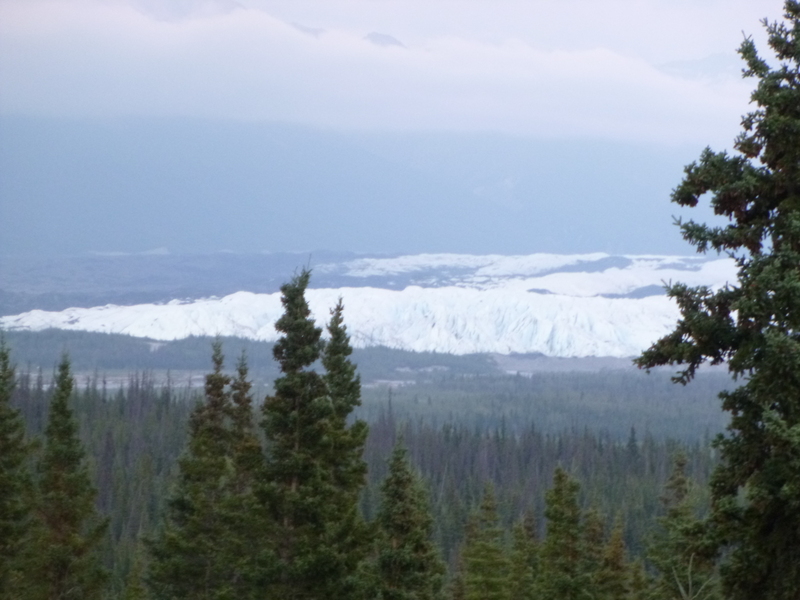 Later in the day when I looked at it more closely, I was kicking myself for not taking the ferry to Valdez, and enjoying the glacier-filled drive up to the Alaska Highway by a partially different route than what I was doing. 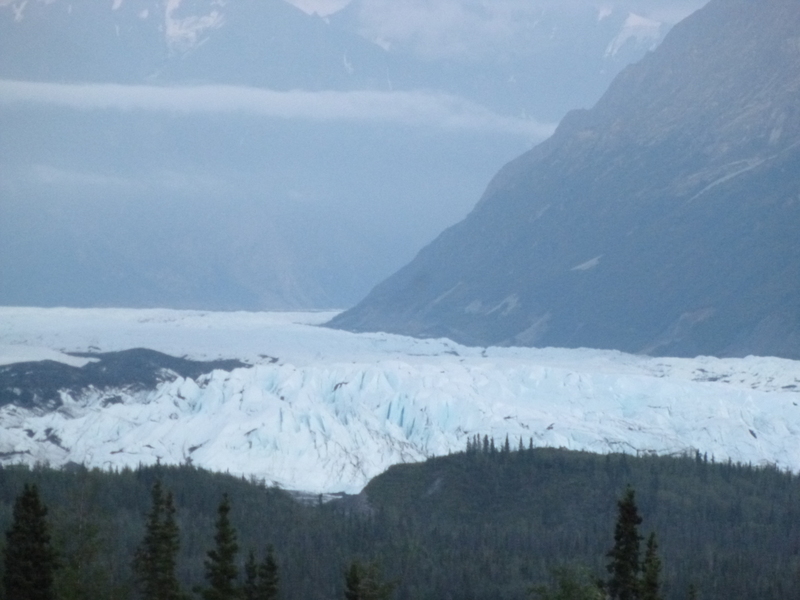 That would have allowed me to cover one of 2 little segments of roads in Alaska that I have not yet been on, plus a couple people have told me it’s one of the prettiest drives. But I’m not 100% sure that route was covered on Wednesdays, and I have an excuse to go back to Alaska at some point in the distant future to drive the few segments of road that I haven’t already done – plus maybe get out to the Aleutian Islands by ferry. So I’m pretty sure I’ll be back somewhere along the way! 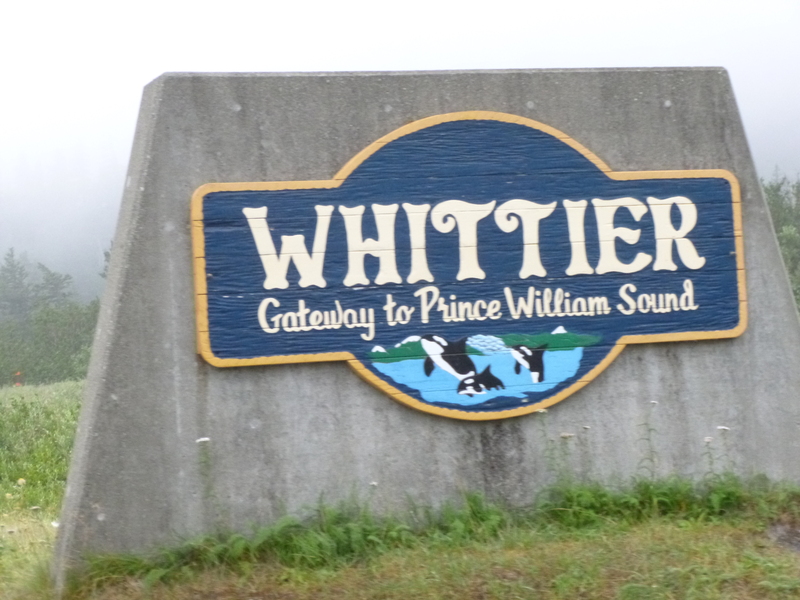 I drove around Whittier, and there wasn’t much to see. There was a big seafood canning plant, and an old windowless hulk of a building that is on a hill overlooking town. 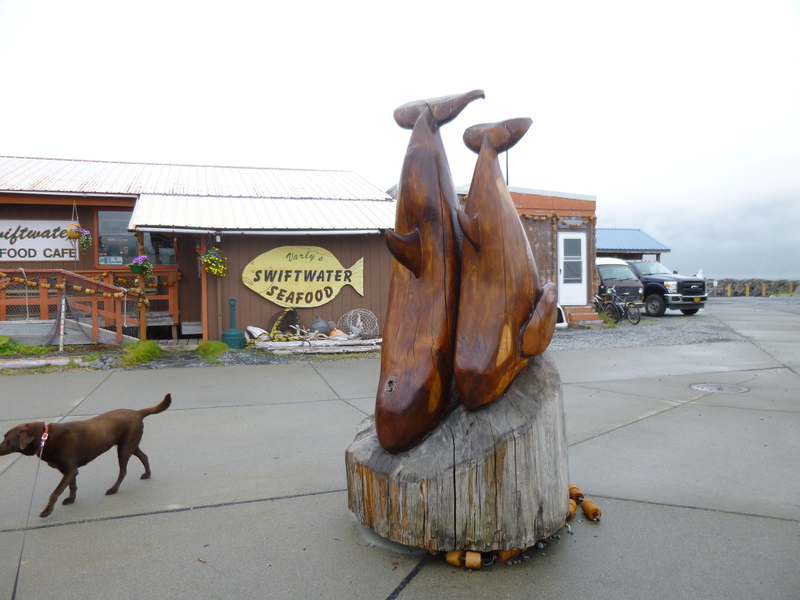 There were a few tourist shops and restaurants, and it’s the take-off point for a lot of fishing charters and sight-seeing trips in the Prince William Sound, which is on my list for a return trip. 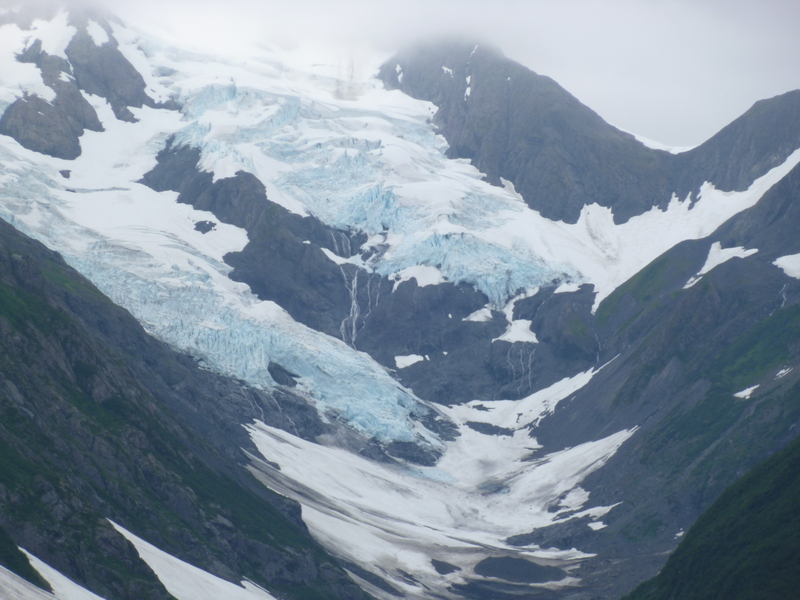 One excursion brags about seeing 26 glaciers in one trip! 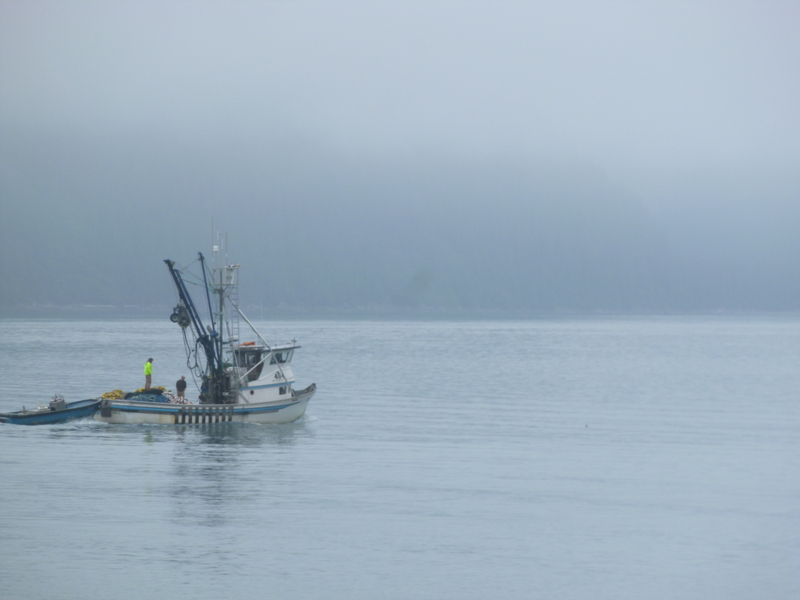 There were people fishing by the docks, and it was just kind of a damp gray day. I didn’t stay too long. 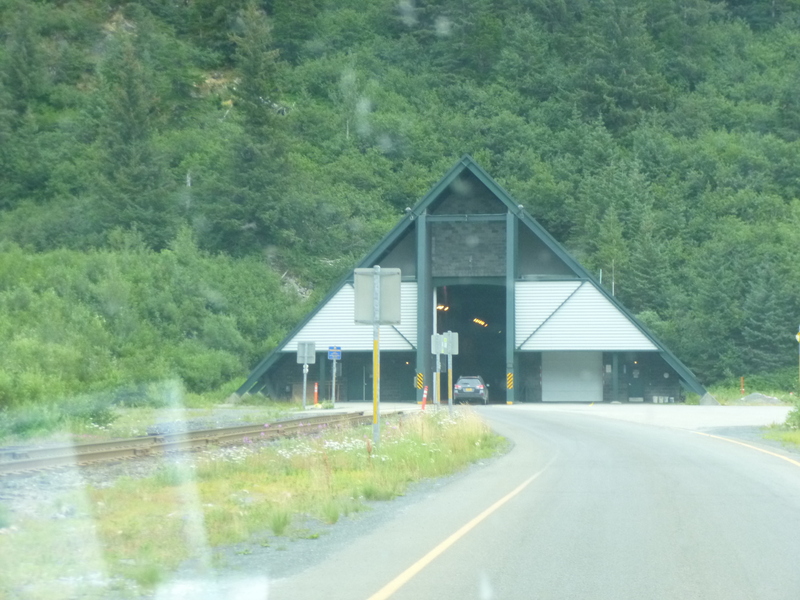 Then I headed back out, and hardly had to wait to go through the tunnel again, and I continued on my way north to the Alaska Highway. 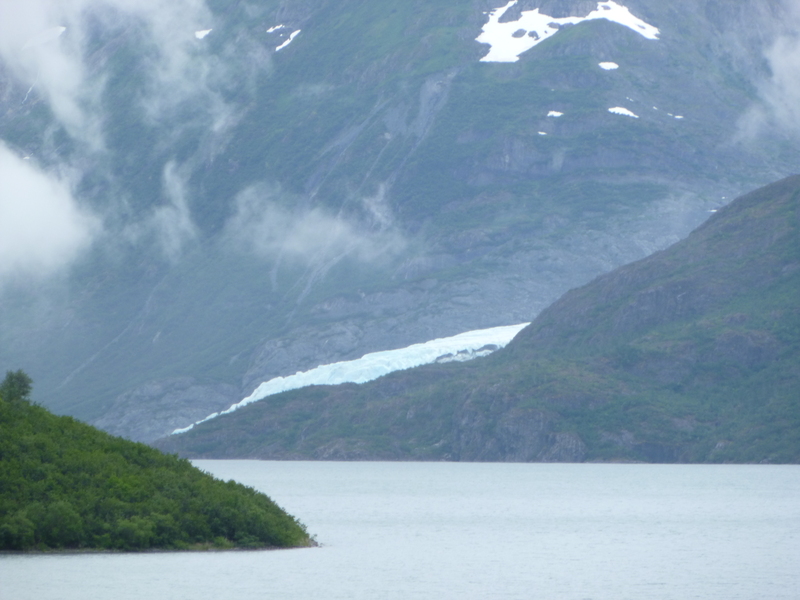 I enjoyed the drive along Turnagain Arm again, but didn’t see anything unusual. I got through Anchorage, and went back through Palmer, where I stopped to shop for a few groceries, and then spent some time in McDonald’s to use the free wi-fi service to get some stuff done on the computer before heading into Canada for a few days. 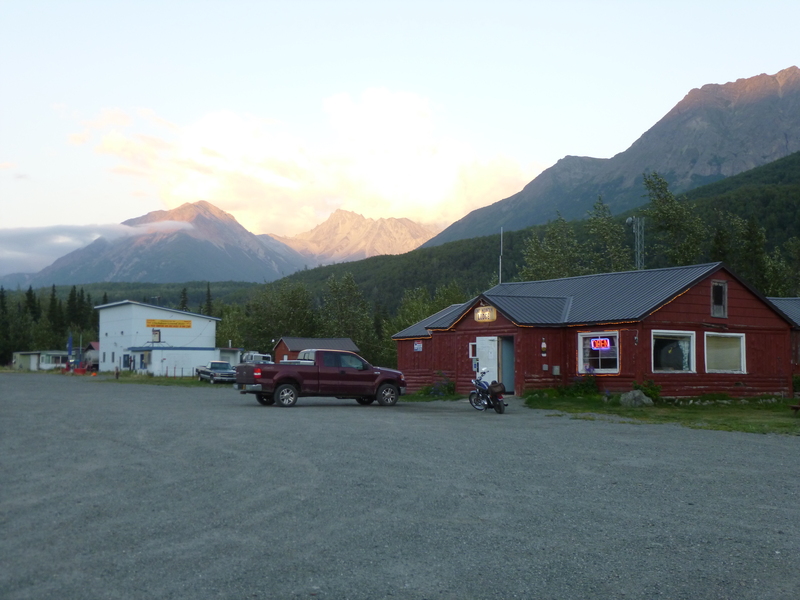 Then I drove through the evening and late evening hours along the Palmer-Glennallen Highway. 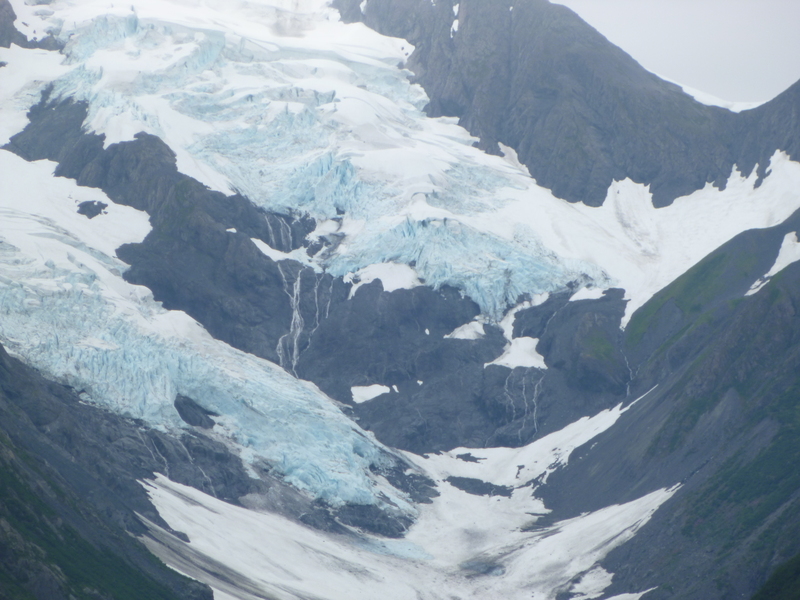 That was another scenic mountain drive, and I was surprised to see some low-lying glaciers that seemed to be flowing from the bottoms of mountains. So I stopped and admired some of those. 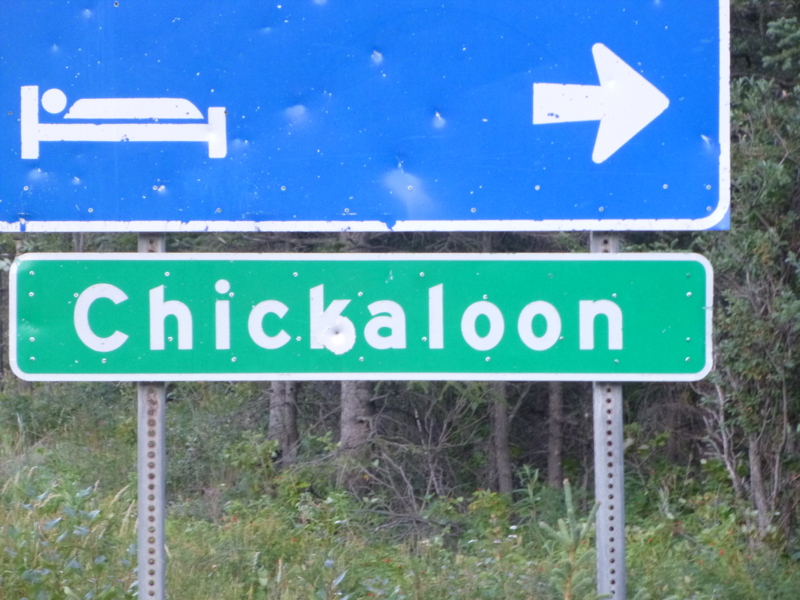 I passed through the town of Chickaloon, which is my favorite name of a town in Alaska. 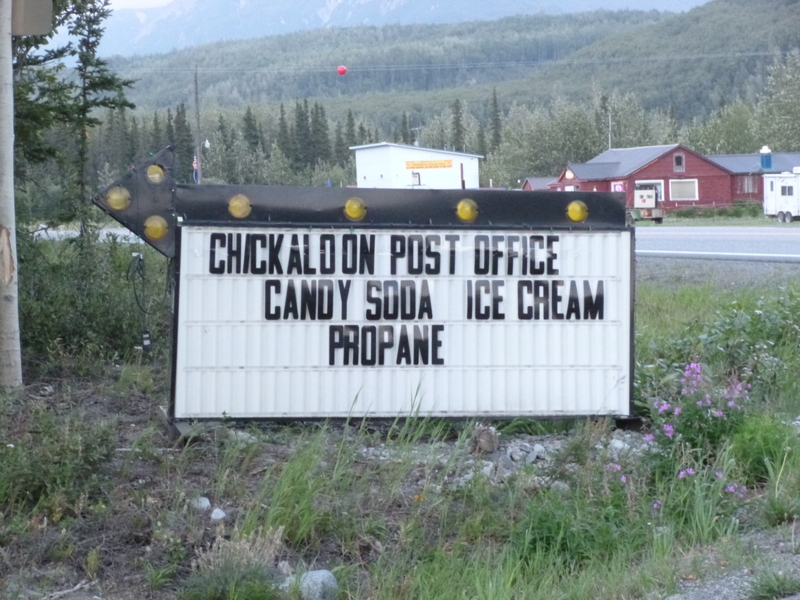 Like many small villages, Chickaloon only consists of a couple multi-purpose businesses, and a post office which also doubles as a candy, soda, ice cream and propane shop. 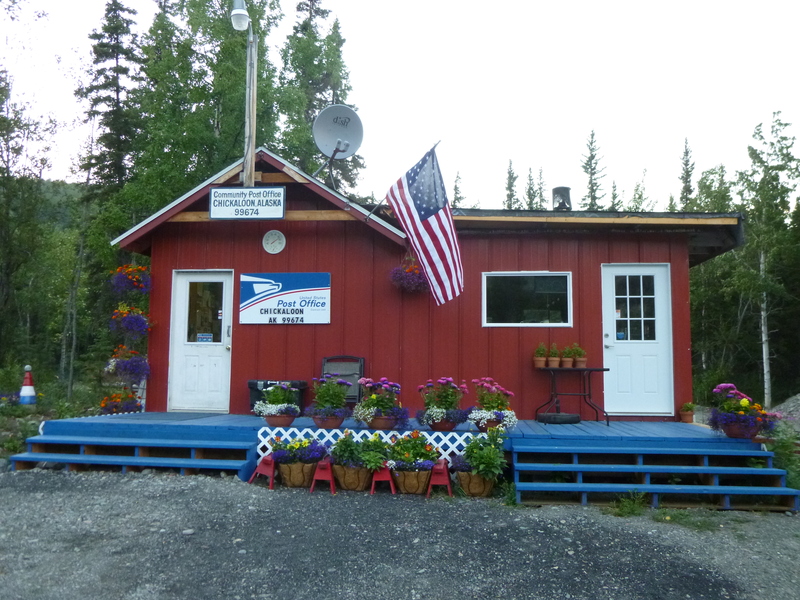 (For my next job, I would like to manage a post office/ice cream/soda/candy shop/library!!) 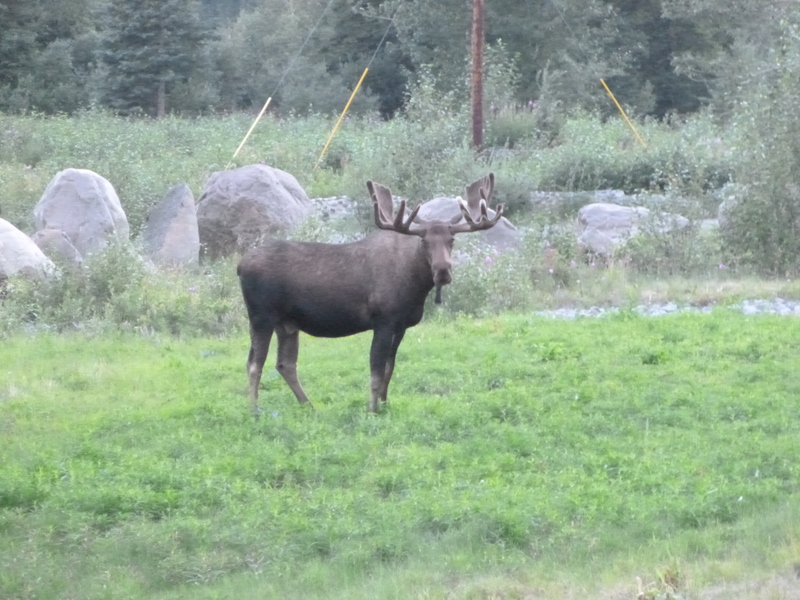 And then, finally, I saw a big bull moose along the side of the road. By this time I had seen quite a few female moose, but never a bull, and I stopped and watched him for quite a while. He was just munching on grasses alongside the road. I continued on, and then saw a porcupine, which I’ve never actually seen before. When it got to be 11:30 or so, I simply found a pull-out with a couple RVs and stopped for the night. I had thought I would be in Canada tonight, but there’s just too many miles! 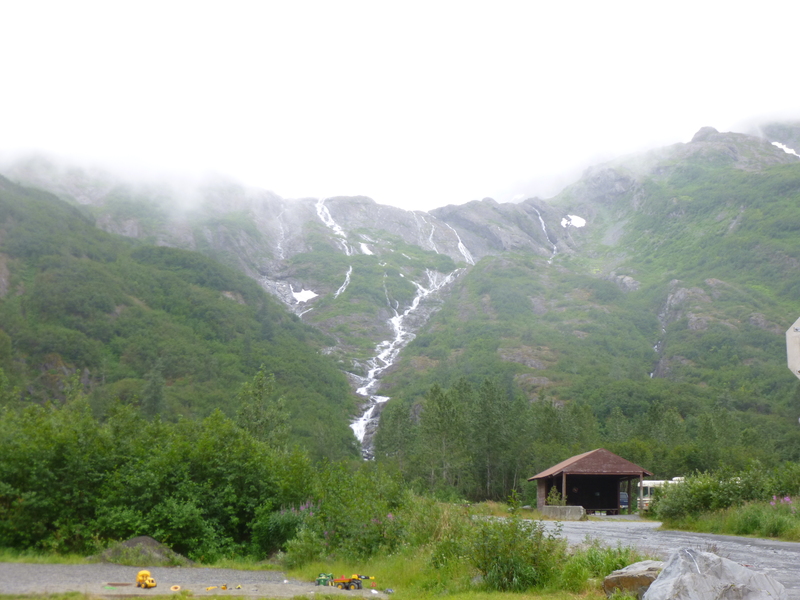 Alaska is complete as far as my journey – I walked more than 56 miles in the end (although I had a couple extra days to do so!) and all 7 donations were done – the North Pole Senior Citizen Center, the Fairbanks Foodbank, the Sled Dogs of Denali, NOLS, the Musk-ox Farm, the Alaska Veterans and Pioneer Home, and the Homer Food Pantry. 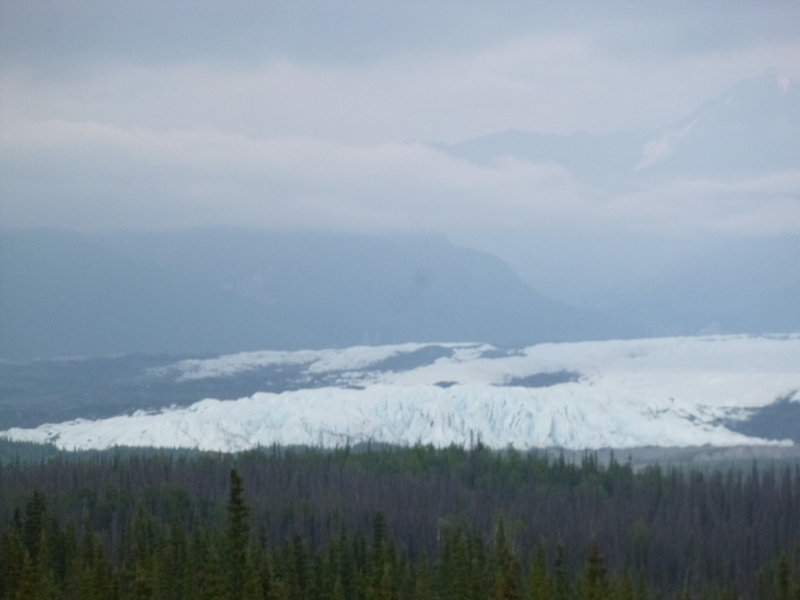 Tomorrow I’ll cross into Canada for sure – I must have been dragging my heels in Alaska a bit – reluctant to leave!